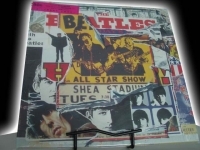 "The Beatles, Anthology II (3 LPs) - EuroSealed"
BEATLES ANTHOLOGY II - 3-LPs - 45-Tracks - Euro Sealed LP. These U.K pressings are sent with the vinyl outside of the jackets when being shipped to the U.S. to protect the covers from damage. Once inside the our wherehouse we then protectively seal the title in a loose re-sealable plastic cover to ensure the quality of the product. This title is brand new & never played condition. 128 Minutes in length and long out of print. If you have gone out and purchased the new Beatles DVD set there is a new (never available 81 minute bonus DVD) with Paul, George, Ringo and George Martin talking about the importance of these anthology CD/LP collections. When you listen to them on that DVD you will understand the importance/history these Beatles and their engineer put to these anthology collections and why you should collect them. There a must for any true collector. It's so rare that on some of these tracks "The Beatles" themselves had a hard time remembering who was participating on some of these masters tracks. These Anthology 3 LP sets (One, Two and Three) are long out of print and are becoming rarer and more valuable day by day especially in these LP pressings. Enjoy being one of the last people in the world to own this rare piece of The Beatles history on vinyl. The second in the series of Rare unreleased Beatles recordings covers the group's famed middle period featuring George Harrison's classic track 11 out-take of TAXMAN. "TAXMAN", the opening title on REVOLVER was Harrison's acerbic and witty view of the inescapable realities of life. Track 12 was the Master Recording - this being a reduction or bounce of Track 11. (These are terms for a recording process taken up by The Beatles around this time, where, by merging two or more existing tracks of a tape while copying it across to a second tape, vacant tracks are created allowing for further overdubbing. Abbey Road was still using 4-Track Recording Machines in 1966 so this process was often necessary.) Issued here for the first time on Vinyl is that Track 11 not dis-similar to the Master but with some notable differences, principally in the clean full ending (instead of the repeated guitar solo) and the "anybody got a bit of money?" backing vocals (instead of the Mr. Wilson Mr. Heath reference). George Harrison penned ONLY A NORTHERN SONG. Although not issued on disc until YELLOW SUBMARINE soundtrack Album in January of 1969, Harrison's ONLY A NORTHERN SONG was written and first intended for SGT. PEPPER, its place in the recording chronology coming between other PEPPER tracks, FIXING A HOLE and BEING FOR THE BENEFIT OF MR. KITE. The Master of ONLY A NORTHERN SONG combined Track 3 (with overdubs) and a "reduction" of this Track 11 (with further overdub), simultaneously mixed into Mono. The mixes presented here in Stereo and slightly sped up, is Track 3 the basic track from February 13th, 1967 with bass and guitar added on April 20th with unissued vocal tracks (yielding a number of lyric vibrations from the Master) overdub onto a separate "reduction", Track 12, flown in. The last Harrison penned track within ANTHOLOGY 2 is the Master of George Harrison's composition that opened Side 2 of SGT. PEPPER'S LONELY HEARTS CLUB BAND, presented here in a fashion not previously available on Vinyl remixed, without George's vocal from the different original 4-track tapes that formed that Master. WITHIN YOU WITHOUT YOU (instrumental) what remains, audible to the fore is a combination of tamboura, tabla, dilruba and swaramandal tracks recorded in March with violins, cellos, and George's sitar track overdubbed on April 3, 1967. ANTHOLOGY 2 features out-takes, demos and alternate versions of songs from the albums, HELP, RUBBER SOUL, REVOLVER, SGT. PEPPER'S LONELY HEARTS CLUB BAND, and MAGICAL MYSTERY TOUR. There are also three previously unreleased Beatles Songs from 1965, several live cuts and the second of The Beatles new recordings, "Real Love", which began as a late seventies demo and completed in 1995 by George Harrison, Paul Mc Cartney and Ringo Starr.